Industry has argued that fracking is not a threat to groundwater resources and that there is no path for methane or fracking fluid in formations deep underground to contaminate groundwater aquifers. … Frack hits could be a path of contamination, particularly in cases where the cementing is below standards. In New Mexico on Feb. 9, 2012, Devon Energy Corp. was fracking a well when an older producing well 600 feet away started spouting 7,000 gallons of oil and wastewater. The fracks had hit the older well and pushed fluids out. If the well had not been properly cemented — a possibility with older wells — the fluids could have migrated outside the well bore and directly entered groundwater aquifers. Some fractures get away from the drillers, extending even as far as adjacent formations. Using microseismic technology, researchers in Pennsylvania recently found one extending as far away as 1,800 feet, as reported by the Associated Press. In the case of the Alberta spill, regulators found that an oil well [3,940] feet away was being fracked, and it had communicated with the well that lost control. 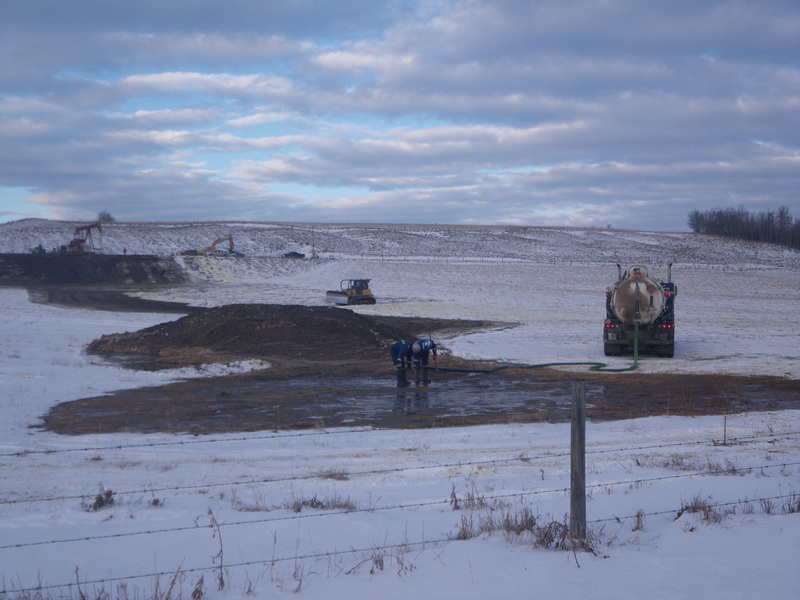 About 20,000 gallons of fracking fluid and oil had to be cleaned up. The fractures move toward the regions of lowest pressure, which can be a nearby well bore. Once a channel is established, the pressures of around 10,000 pounds per square inch travel rapidly across the formation to the older well. It pushes fracking fluid and whatever is at the bottom of the producing well — oil, gas and produced water — up the old well bore, which is not equipped to handle high pressures. “The frack fluid crosses the path of least resistance,” said James Amos, supervisory environmental protection specialist with the Bureau of Land Management in New Mexico. It runs up the well bore and can cause the production tank that’s collecting the oil to overflow. To the lay observer, it appears to be a surface spill. But in reality, such spills are caused by fracking hundreds or even thousands of feet away. … The worst-case scenario is when the fluids, propelled by high pressure, travel outside the steel pipe casing the producing well, through a bad cement job, and the brine enters groundwater aquifers. The risk is high when the frack hits communicate with older producing wells or abandoned wells. … “If it doesn’t get inside the well bore, it can migrate up the outside of the well bore; there are water aquifers up there,” Beck said. He described aging cement as a layer of bubble gum wrapped around the steel pipe casing a well. It separates from the well bore with time, especially in areas where the geology is sandy or swampy, and provides a path to the groundwater aquifer. How probable is it? … In the Montney Formation of Alberta, about 30 percent of the well bores that are up to 1,500 feet apart experience frack hits, Beck said. The Montney is similar in geology to the Bakken Shale of North Dakota. The hits are common enough on New Mexico federal lands that some operators are temporarily shutting down their producing wells while new wells are being fracked, Amos said. They install cast-iron plugs downhole to prevent the fracking fluid from shooting up the well bore and damaging the producing well, he added. Frack hits are usually not reported to state regulators unless there is a spill of fracking fluid from the producing well. In such cases, the incidents masquerade in state databases as production tank overflows due to an unexpected increase in pressure — a “kick.” That seems innocuous until one pauses to examine why, exactly, a producing well that should experience stable pressures would experience a kick. “They [frack hits] periodically occur, but they don’t necessarily put down the exact or the surmised cause. Most of the time we’ll just get a spill report that says all of a sudden we overran the tanks 100 barrels to the bermed area,” said Steve Sasaki, chief field inspector at the Montana Board of Oil and Gas. Workers – without respirators – take a closer look while cleaning up the Innisfail, Alberta frac communication event or “Frack Hit,” January 13, 2012. Click on photos to enlarge. Curran says that since the ERCB began monitoring interwellbore communication this year, there have been 21 incidents, but they rarely cause damage. BC OGC Safety Advisory 2010-03 Communication during fracture stimulation Fracture propagation via large scale hydraulic fracturing operations has proven difficult to predict. 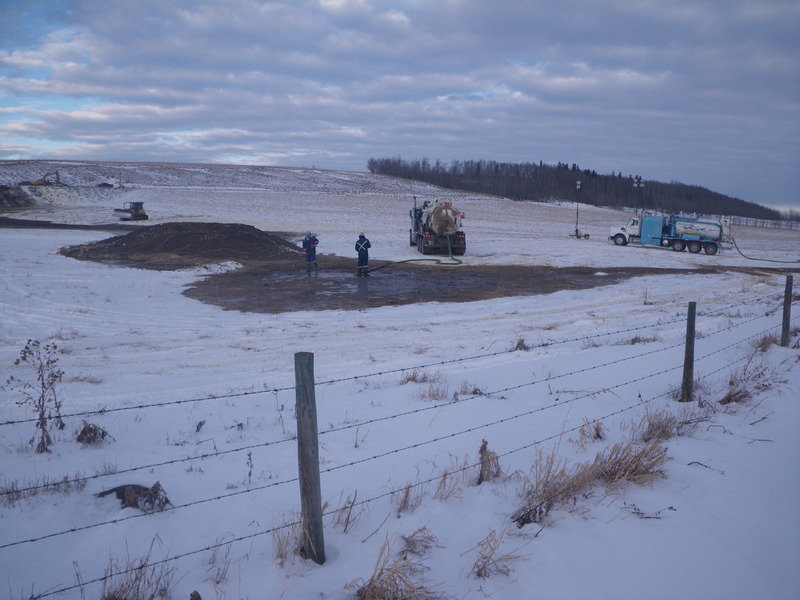 Alberta company prevents environmental fracking disasters by Surface Solutions Inc., April 2, 2013, mining.com A “frac” can go horribly wrong when there is a “communication” communication breakdown during the process to one or more neighboring wells. A communication breakdown means the fracking well is causing a disturbance with a non-fracking well. The majority of oil companies fracking in Alberta do not currently monitor their frac jobs. If the downhole pressure reaches a point to create “communication” with other wells. The result can be environmentally and financially disastrous, blowing off wellheads, contaminating water sources, spilling frac fluid and oil all over other well site leases.